Dear people who value eternal life: grace, mercy, and peace to you from God the Father and our Lord and Saviour Jesus Christ. Amen. Different perspectives change our value of things. Let’s take your household possessions, for instance. Right now, sitting in your house, your possessions have a certain value to you. Your furniture, your TV, your wardrobe, your jewellery all have a certain value. If you were to tear a jacket or lose a piece of jewellery the loss would probably sting and bring you some amount of sorrow. Now let’s change the perspective. Let’s say you are moving across the ocean on a ship with your possessions, and a great storm hit. You would look at things a little differently. With all your possessions stowed away on the ship, as waves start to beat down on the ship, the value of those possessions decreases with the increasing fear of the storm. If it becomes necessary to lighten the load in order to stay above water, undoubtedly you would be ready to part with furniture even if it was a precious heirloom. Better to lose trunks of clothing than your life. Better even to lose precious jewellery and heirlooms and be saved rather than to keep them and drown in the ocean depths. This different perspective changes our values. In the perspective of being compared to life, possessions decrease in value. Better to enter life crippled than with our bodies intact go to hell. This is meant to change our perspective. Are there things in your life to which you cling that may jeopardize your eternal life? However much you may value such things, cut them out of your life. Is something keeping you from regularly hearing and reading God’s Word? Cut it out. Are certain friends leading you to gossip and speak ill of others? Cut them out of your life. Compared to eternal life, we should be more than willing to give things up and cut things off that cause us to sin and endanger our hope of everlasting life. Yes, even when it comes to things we hold dear. This isn’t just hyperbole or exaggeration from Jesus. He really wants to change our perspective on how we view things in this life, even our bodies. If cutting off our hands and feet would prevent us from sinning, this is something that we should most certainly do. But would cutting off limbs or plucking out eyes prevent us from sinning? Would this solve our problem? If we cut off our hand that does what it should not do, we’re going to sin with our other hand. If we cut off our foot that walks into evil ways, we will still manage to find a way to hop into sin with our other foot. If we tear out our eye that lusts after what is not ours, we will still sin the same with the other eye. We wouldn’t be any better off. And even with losing all of our members, what about our heart, which is the root of the problem? Our heart is full of sin. We confess that we are sinful by nature. It goes beyond our limbs. It goes beyond our thoughts, words, and actions. Our sinfulness goes to our heart, to our core, to our very being. We do not benefit at all from cutting off a limb because we have sinned with it. Even tearing out our heart would not solve our problem; it would only mean that we would kill ourselves. You cannot cure a sinful heart by maiming the body. There’s only thing that solves our problem: that the Son of God would come to earth from heaven and save us from ourselves; that a Saviour would come and save us from our sinful hands, feet, eyes, and hearts. And this, the Son of God, even Jesus Christ our Lord did. He became man. The Word became flesh. He took on our flesh and did what we could not do. Jesus fulfilled the Law of God perfectly in thought, word, and deed. Jesus fulfilled the Law for us. Jesus’ hands never sinned. He never took what wasn’t His. He never struck someone in anger. He never refused to give a helping hand. Jesus’ feet never sinned. He never walked where He shouldn’t walk. He never stomped His feet in anger. He never walked away from someone in need. Jesus’ eyes never sinned. He never lusted. He never coveted. He never avoided eye contact with someone who needed help. His heart was filled only with love and compassion for His entire creation. Jesus fulfilled what we are unable to fulfil. 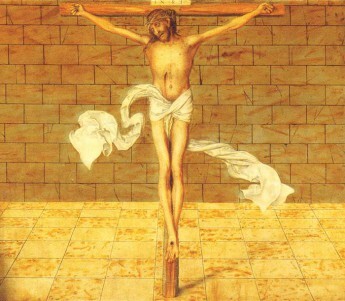 Jesus’ hands, with which He never sinned, nevertheless were nailed to a cross. Jesus’ feet, which only walked on the paths of righteousness, were pieced with nails for our sake. His eyes, which never sinned, still looked with forgiveness even upon those who crucified Him, even as a crown of thorns was forced on His head. Jesus’ heart, which never sought its own good, but only the good of others, was pierced for our transgressions. There was no other way. There’s no way we could do what God’s Law demands. There’s no way we could save ourselves. Jesus came and died in our place. Jesus gave His life for us. Jesus was wounded for our transgressions and was crushed for our iniquities; with His stripes we are healed (Is. 53:5). Jesus’ death paid for our sins of hands, feet, eyes, and heart. Jesus has paid the price of your sins. Jesus has taken the punishment of your sins. Now you can get up and leave that pew justified and forgiven, with your conscience at peace. You can go home without the baggage of sin hanging on your back. God’s not going to come after you for payment for your sins. They’ve already been paid for in full! Now that’s a different perspective! There’s nothing in this life worth comparing to the eternal life Jesus has earned for us. Why cling to anything in a ship that is going down when you have eternity in Paradise to look forward to? In the perspective of eternal life, nothing else has any value. Jesus’ death for us gives us a completely new perspective. We have the promise of eternal life. That has eternal value. Amen. Dear friends of God: grace, mercy, and peace to you from God the Father and our Lord and Saviour Jesus Christ. Amen. Leading up to the year 250, roughly two centuries after the death and resurrection of Christ, Christians in general did not take these words of Scripture so seriously. Sure, they called themselves Christians, and they sometimes even met on Sunday mornings to hear God’s Word, but they were very friendly with the world. They spent the focus of their time, energy, and money on their friendship with the world. They became so immersed and friendly with the world that they started to act like the world. Many lived just like the rest of the world around them. They followed their passions and selfish ambitions instead of God’s Word. They married unbelievers and did not teach their children the faith. They lived very worldly, undisciplined lives, and the church was in a declining, almost slumbering state. Even the pastors and bishops were poor examples as they also chased after their selfish ambitions and neglected their duties of teaching and admonishing the people. They thought that as long as they were friends with God, it was fine that they were friends with the world. Then, in the year 250, came the decree of the Roman Emperor Decius. All residents of the Empire were to sacrifice to the Roman gods before the magistrates of their communities. Emperor Decius saw this as good for the Empire. For the safety of the Empire, the Empire should be united. The way to have peace in the Roman Empire was to make sure that the people of the Empire were loyal to the state and to the gods of the state. Anyone who refused to offer a sacrifice to the Roman gods risked torture and execution. The state declared open persecution on those who would not submit to and worship the Roman gods. A great number of those in the church were not ready for this. Having the focus of their lives on earthly matters and friendship with the world, Christ’s Word had fallen by the wayside. Many who had been part of church assemblies sacrificed to the Roman gods to avoid persecution. Many others purchased certificates saying that they had sacrificed to the gods. Such a certificate would avoid having to actually perform the sacrifice, but nevertheless confessed the same thing – submission to the Roman gods and the rejection of God’s Word. Multitudes of weak believers fell away. Others, who were never true believers but were merely in the outward fellowship of the church, rushed at the first chance to offer a sacrifice and thus disassociate themselves from Christianity. This was a dark, sad time for the church. So many people did not realize that friendship with the world is enmity with God; that by seeking to be friendly with the world they had actually abandoned God and made Him their enemy. Such people had already abandoned God before the persecution started, but it was not apparent since they continued in the outward fellowship of the church. Here we are in the year 2015 and we find the church in a similar situation as she was some eighteen hundred years ago. Christians in general do not take the words of Scripture so seriously. Sure, many call themselves Christians, and they may even meet on Sunday mornings once in a while, but more than ever, many are being very friendly with the world – seeking the approval of the world, forgetting what Christian conduct is supposed to be because they are so immersed in the conduct of the world, marrying unbelievers, not teaching the faith to their children, and living worldly, undisciplined lives. The church is again in a declining, almost slumbering state. How many pastors and bishops today neglect their duties of teaching and admonishing because they don’t want people to be upset with them? Do we think that somehow we can be more successful than the early church in being friends with the world and friends with God? We also are on the cusp of persecution, at least from all appearances. Two of the major federal political parties, the Liberals and the NDP, will not even allow candidates that are not in favour of the murder of the unborn. Christian bakers and photographers lose their livelihood because they refuse to cater to those who oppose God’s Word. Christian clerks are thrown in jail for not issuing marriage licences to those who God says cannot get married. How long until those who are faithful to God’s gift of marriage and children are thrown to the lions? And when that happens, will we be ready, or will our friendship with the world cause us to turn away? We need to take an honest look at our lives. Are we getting too friendly with the world? What are we spending our time and money on? What ideals do we believe to be right – those in Scripture or those of our godless society? What are we showing by our actions to be important to us – earthly food or spiritual food? Will this congregation still exist here in this place ten years from now through our support or will we just pursue worldly passions and allow the church to close its doors? Friendship with the world is enmity with God. Whoever wishes to be a friend of the world makes himself an enemy of God. But James provides the answer to our predicament. He tells us to cleanse our hands and purify our hearts (4:8), to be wretched and mourn and weep (4:9), and to humble ourselves (4:10). He is not telling us to become depressed and sad, he is telling us to mourn and weep over our sin, and to turn away from our sin. He is telling us to turn away from our friendship with the world. James writes that God yearns jealously over the spirit that He has made to dwell in you. God yearns for you. He longs for your soul. He has created you and made you His own in your Baptism, and He does not want to lose you to the world. Thus, He gives more grace (4:6). He gives more forgiveness. God longs for you and continually calls you back to your Baptism, to remind you that He made you His friend through Baptism. He reminds you of the cleansing you received in your Baptism. And He offers you the very body and blood of His Son to cleanse your hands and purify your hearts from sin and to give you life and salvation. Because God yearns jealously over the spirit that He has made to dwell in you, He continually pours out His forgiveness to you. Through His continual forgiveness to you, He changes your attitude towards Him, increasing your love for Him. He changes your heart to seek after heavenly things rather than earthly things. He reminds you that the world is passing away, along with its desires [1 Jn. 2:17]. God reminds you thus to seek first His kingdom, to desire above all to have a relationship with Him. And everything else that you need, all the lesser gifts, will be given you also [Mt. 6:33]. Besides, the world’s benefits are temporary. They are fleeting, vaunted pleasures. They are overhyped and oversold by the devil. The devil lies and tricks us into believing that what he offers is better than what God offers. But the world offers no contentment. Pursuit of gain or the passions of the world never satisfy. Friendship with the world always leaves us empty, searching for more. On the other hand, the benefits of friendship with God are eternal. Not only do we have peace in this life knowing that our sins are forgiven and that we are in God’s good favour, but we also have the promise of eternal joy and happiness in the presence of God forever. God’s friendship is eternal and carries with it eternal benefits. To understand the love and friendship of God toward you look to the cross. His love for you was there outpoured. Christ died on the cross to forgive the friendship you have shown to the world, and to forgive the times you have neglected His friendship. His friendship toward you was there proven beyond a shadow of a doubt, and the benefits of His death are yours. There is no greater love than that Jesus gave His life for you. There is no greater friendship that that which He has shown to you. So whenever the friendship of the world tempts you, look to the cross to understand real friendship. Amen. Dear believers: grace, mercy, and peace to you from God the Father and our Lord and Saviour Jesus Christ. Amen. A desperate father sought help for his son. His son was demon possessed. The demon seized the boy, throwing him down and he would grind his teeth and become rigid. The demon would cast the boy into fire and water in order to destroy him. This had been happening since childhood. When this man sought help, Jesus was up on a mountain with Peter, James, and John, but the other nine disciples were available. So this man went to Jesus’ nine disciples to cast the demon out, but they did not have the power to do it. These nine were apostles, which means they were representatives of Jesus. They were called by Jesus and given authority over unclean spirits (Mark 6:7). Yet they failed to do what Jesus had called them to do. The fact that the disciples were unable to cast out the demon surprised them. Thus they asked Jesus later, “Why could we not cast it out?” Mark records that they had cast out many demons as part of their apostolic duty (Mark 6:13). But in this case, they failed. They were not able to do it. In response to the disciples’ question why they couldn’t cast the demon out, Jesus answered, “This kind cannot be driven out by anything but prayer.” Apparently they had cast out other demons without prayer. They were given the authority by Jesus to cast out demons, so the demons obeyed Jesus’ command spoken through the mouth of His representatives. But in this case, the demon did not respond. The disciples did what they usually did to cast out demons, but the demon didn’t listen. This threw the disciples into panic and despair. They didn’t know what to do. Maybe there was a problem with Jesus’ command. They doubted their authority as representatives of Christ. They lost faith in what Jesus had told them. Thus they didn’t pray. When they came across this problematic situation, they didn’t turn to God in prayer, seeking His help. The disciples were believers and followers of Jesus, but if they would have completely believed, they would have sought God in prayer for help to do what they knew He had told them to do. Just like every believer of all time, they struggled with unbelief. We know this because Jesus called them a faithless generation. He said, “O faithless generation, how long am I to be with you? How long am I to bear with you?” The parallel in Matthew records Jesus telling the disciples they could not cast out the demon because of their little faith and telling them that if they had faith as a grain of mustard seed they could move a mountain (Matt. 17:19-21). If they would have been believing, they would have prayed that Jesus would do what He promised He would do; that Jesus would command the demon to depart through them as He had sent them to do exactly that. They were unbelieving, so they did not pray. The disciples weren’t the only ones struggling with unbelief. The father who sought Jesus’ help also struggled with unbelief. Why would God allow his son to be demon possessed? Why would God allow his son to have such a debilitating illness? Where is God’s mercy when his boy is deaf and mute and having seizures while being thrown into water and fire? And on top of it all, God’s representatives were unable to do anything for his son. The father must have just about lost all hope. Thus even to Jesus he said, “If you can do anything, have compassion on us and help us.” If you can. The father doesn’t know any more. Maybe Jesus can help, maybe He can’t. The father struggled with unbelief, just like the disciples did. Jesus responds, “’If you can’! All things are possible for one who believes.” Whatever God has promised is possible for the one who believes. Jesus isn’t saying that if you have enough faith you can do whatever you want. He isn’t saying that if you have enough faith you can have whatever you want. He isn’t even saying that if you have enough faith your children will never be sick and your family will never suffer. Jesus is saying that everyone who has faith in Him will receive everything Jesus has promised. To the one who believes Jesus’ promises, those promises are his. The father responds in faith to Jesus’ Word. He says, “I believe; help my unbelief!” He confesses his faith in Jesus, but at the same time confesses his sin of unbelief. He prays for help from Jesus. Jesus, help my unbelief. This father did what the disciples did not do. He prayed for help with his unbelief. With his prayer, the father showed that he was totally reliant on Jesus, throwing himself at Jesus’ mercy. I believe; help my unbelief. Have compassion on us and help us. Instead of despairing because they were unable to cast the demon out, the disciples also should have prayed to Jesus saying, “I believe; help my unbelief!” Instead of allowing themselves to be defeated, their faith should have risen up and appealed to Jesus in a fervent prayer that He make good on His promise to them to cast out demons. They also should have thrown themselves at Jesus’ mercy and prayed for Him to have compassion on the boy. We should take this to heart in the trials that we must confront in this life. Jesus has not promised us to take all our trials away in this life. He has not promised us that He will give us everything for which we ask. But He has promised to be with us through all trials. He has promised that because of His death for us we will be delivered from all our trials at the end of our lives. He has promised that His death is our death and for that reason we will inherit eternal life with Him when we die. He has promised us that our sins are forgiven and our transgressions are covered. Jesus did have compassion on the father and his son. He commanded the evil spirit out of the boy and never to enter him again. The boy lay like a corpse so that most of the people said, “He is dead.” But Jesus took him up by the hand and lifted him up, and he arose. So also Jesus will lift us up out of the ground when we lay dead. He will take us by the hand and lift us up, so we will arise. As Jesus rose from the dead, so He will raise us up from the dead along with all our loved ones who have died in the faith. This is sure and certain because Jesus has promised it. “I believe; help my unbelief!” We can cling to His promise even us we struggle in anguish with doubt and unbelief. We can cling to His promise even as we suffer and our families suffer in this world of sin. Jesus will have compassion on us. Because of His death for us we have the promise of eternal life. I believe; help my unbelief. Amen. Sin makes us deaf and mute. Certainly to varying degrees, but it is nevertheless true. Our bodies are not perfect as God created them to be. Because of sin, even our bodies suffer the consequences. Some people are born deaf or with a speech impediment. Some people develop such disabilities through injuries or illness. Losing the sense of hearing has become a normal part of aging in this sinful world, which is shown by many of us who require hearing aids in order to hear. But even those of us who have our speaking and hearing faculties in relatively good health do not hear or speak perfectly. We often must ask for something to be repeated to us. We stumble over words especially if we are nervous or flustered. We say things we don’t mean. We mean things we don’t say. Even more than all of this, because of our sinfulness, we are by nature spiritually deaf and mute. We all too often resemble those of whom Jesus says, “seeing they do not see, and hearing they do not hear, nor do they understand.” (Mt. 13:13) How often are we deaf to the needs of others? How regularly are we deaf to the needs of mission work; even deaf to the needs of our own congregation? And how often do we have a speech impediment when it comes to speaking up for the helpless and the needy; for the unborn and the elderly? How often do we hold our tongue from speaking God’s truth because we are afraid that it will make us unpopular? These symptoms are all because of our sin, because sin makes us deaf and mute. Deaf and mute, Jesus has compassion on us as He had on the man brought to Him who was deaf and with a speech impediment. Jesus gave the man personal attention. He took him aside privately, away from the crowd. Then Jesus healed the man in a peculiar way. We know the power of Jesus’ Word. He speaks, and whatever He says, happens. Jesus cast out a legion of demons with His Word (Mk. 5:8). He raised Lazarus and Jairus’s daughter from the dead with His Word (Jn. 11:43). In another situation with a boy who was deaf and mute, Jesus healed him with His Word alone (Mk. 9:25). But here, Jesus takes a physical approach. For this man who was deaf and had a speech impediment, Jesus, after taking him aside, put His fingers in the man’s ears, and after spitting, touched his tongue. And looking up to heaven, He sighed and said to him, “Ephphatha,” that is, “Be opened.” Although Jesus could have healed the man with His Word alone, He chose to also physically touch the man’s ears and tongue. It’s almost a sort-of sign language for the man who could not hear or speak. The man could see Jesus reaching over and touching his ears and spitting and touching his tongue. The man could see Jesus’ chest rise and fall as He sighed and His head tilt up to look to heaven. Yet, with these physical signs, it was still Jesus’ Word which healed the man: Ephphatha. Be opened. Jesus deals with us in this same way. He has given us His Word which heals us of our sin. Jesus sends pastors to absolve sinners, saying, “If you forgive the sins of any, they are forgiven them” (Jn. 20:23) and “The one who hears you, hears me” (Lk. 10:16). So we have the Word of God proclaimed to us that our sins are forgiven; that our spiritual deafness and muteness is forgiven. The power is in God’s Word. God speaks, and whatever He says, happens. Still, Jesus takes a physical approach. Although His Word alone is enough to make us whole, forgiven, and absolved, Jesus has still instituted physical means by which He gives us spiritual healing. Along with God’s Word – I baptize you in the name of the Father, and of the Son, and of the Holy Spirit – water poured over the head and spiritually deaf ears creates faith, opening our ears. Along with God’s Word – Take eat, this is my body, and take drink, this is my blood – bread and wine given onto our mute tongues forgives our sins and loosens our tongues to confess the faith. Yes, God’s Word is enough. But for us sinners who struggle with spiritual muteness and deafness, Jesus gives us these visible elements through which we can see what He gives us. Just as the Word enters through the ear in order to strike the heart, so also the Sacraments enter through the eye in order to move the heart. The Word and the Sacrament have the same effect. As Saint Augustine put it, the Sacraments are the visible Word because they are received by the eyes, a picture of the Word, signifying the same thing as the Word (cf. Ap XIII:5). In the water of Baptism, we see a sign of the washing away of sin that God has promised accompanies Baptism (Acts 2:38, 22:16). We can visualize the washing away of sin as the water washes over the head. We can visualize the pouring out of the Holy Spirit that God has promised accompanies Baptism (Titus 3:5-8). We can relate to all the times God saved His people through water – whether in the ark through the Flood or on dry ground through the Red Sea. In the bread and wine of the Lord’s Supper, we see a sign of the spiritual nourishment that Jesus has promised accompanies the eating of His true body and blood (Mt. 26:28). Jesus personally takes us aside from the crowd and gives us His true body and blood which give us the forgiveness of sins, eternal life, and salvation. We can relate to all the times God miraculously fed His people – whether with manna from heaven, ravens bringing bread, or providing oil and flour that never ran out. The Sacraments are Jesus taking us aside from the crowd privately, giving us the forgiveness of sins through His Word, and then still giving us the forgiveness of sins through physical means that we can touch and see. Jesus opens our ears to hear His Word. Jesus forgives our sins and looses our tongues to sing His praises. Ephphatha. Be opened. Whatever Jesus says, happens. He opens your ears to tell you your sins are forgiven because of His death on the cross. He opens your ears to invite you to the Sacrament of the Altar. Then He also physically gives you what He has promised in the Sacrament: His true body and blood for the forgiveness of your sins and the strengthening of your faith. Amen.